Just after her sixteenth birthday, Will’s daughter Georgie suffers kidney failure. She needs a transplant but her type is rare. 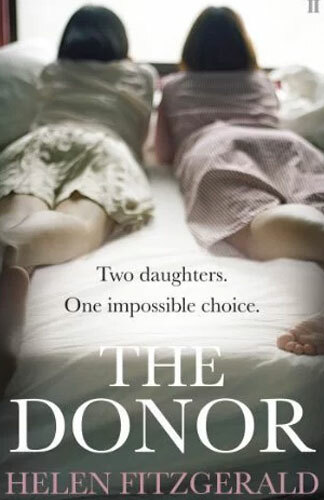 Will, a single dad who’s given up everything to raise his twin daughters, offers to be a donor. Then his other daughter, Kay, gets sick. She’s just as precious, her kidney type just as rare. Time is critical, and Will has to make a decision. Should he try to buy a kidney? Should he save just one child? If so, which one? Or is there a fourth solution – one so terrible it has never even crossed his mind? As you can tell from the cover and synopsis above, The Donor is being marketed to fans of Jodi Picoult-style novels about moral dilemmas. It has moral dilemmas in spades, and Will, indecisive at the best of times, agonises over them. It also has murder and even a private detective in it so it certainly qualifies as crime fiction. But what appealed to me was that I read somewhere – not on the cover – that it was funny. I was intrigued by the idea of a funny novel about twin teenage girls who suffer from kidney failure and their devoted father who is desperate enough to consider sacrificing his life to provide them each with a kidney. Could this novel work? Could it really be funny? It does and it is. Helen Fitzgerald doesn’t gloss over the seriousness of the girls’ medical condition, but the way the various characters deal with the situation is at times hilarious. She writes with warmth as well as black humour and this takes real skill, which is also shown in the vivid characters and compelling plot. The Donoris set in Glasgow where Helen Fitzgerald now lives, and her experience as a parole officer and social worker there is put to good use in this novel. It is her seventh novel (six for adults, one YA). I haven’t read her earlier ones, but I want to now.